"Kazoo Blowing, Westbrook College Parents Weekend, 1977"
A group of twenty Westbrook College students, blowing kazoos, walks down the College Street sidewalk in front of Alexander Hall in this 1970s black and white snapshot.. 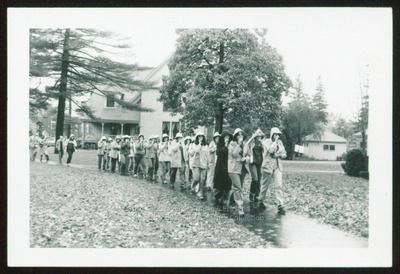 The young women wear hooded rain jackets and slacks. A bit of a ways behind them are a group of faculty or staff or parents. Visible behind the young women is the "Johnson Club" house and its garage. Written in black ink on the back of the photo are the following words: Parents Weekend '77.